Menyewa rumah atau apartement di wageningen membutuhkan strategi dan penyiapan dokumen yang terencana dan tersusun baik. pada tulisan berikut ini saya menyampaikan strategi dan pengalaman saya dalam mendapatkan rumah di wageningen. Pada saat tulisan ini dibuat 22 September 2016. Mendapatkan sewa rumah dan apartemen keluarga untuk 3 orang atau lebih dengan harga yang terjangkau adalah hal yang sanag sukar. ketatnya peraturan bahwa untuk 3 orang anggota keluarga harus menyewa apartement dengna 3 ruang (1 living room, 2 kamar tidur). Muga meningkatnya jumlah mahasiswa baru, dan tetapnya jumlah hunian menjadi salah satu sebab. berbagai penyedia rumah dan apartemen sewaan memiliki berbagai kekurangan dan kelebihan. berikut akan saya paparkan satu persatu pengalaman saya dalam mencari apartemen di wageningen. Do you love insects? Wouldn’t it be great that in future we are able to help feeding the hungry planet? We are looking for a researcher with a record in the field of research on insect processing, or processing of other protein/fat rich biomasses, who is able to run independent research and coordinate the work of MSc and BSc thesis students. Moreover, the candidate should have the capacity to interact with industries in the field and to acquire research funds on competitive calls and contracts with private companies. The FQD group has multiple activities in the insect research with the focus on the biomass processing and fractionation. We perform advanced research in the chemical and physical modification induced by storage and thermal treatment. This is a very active sector in food science dealing with the valorization and use of new sources of proteins and fats as food ingredients. • 2-3 years of research experience on insect processing or in alternative other sources of proteins- and fats-rich biomasses for food applications. A job at an organisation that will challenge you every day to provide our clients with the best possible solution. As researcher you will be part of an ambitious team working on a wide range of issues with plenty of scope for initiative. Personal input and responsibility are an integral part of our culture. We offer you a temporary contract for 38 hours per week, which might lead to a permanent employment contract after a successful evaluation. Working hours are flexible. € 3.123,- up to € 4.978,- gross per month (scale 10 or 11 of the Collective Labour Agreement for Dutch Universities), including 8% holiday pay and 8.3% end of year remuneration. We not only offer a competitive salary but also an attractive number of leave days (232 hours), possibilities for study leave and a pension of the ABP Pension Fund. For more information about this position, please contact Associate Professor Ruud Verkerk, Ruud.Verkerk@wur.nl telephone number +31 317 483 226. For more information about the contractual aspects, please contact Linda Broenink, HR Advisor, telephone number +31 317 484 342. You can apply online at http://www.wur.nl/en/Jobs/Vacancies.htm until 22 March 2019. Luxembourg Institute of Science and Technology (LIST), Biosystems and Bioprocessing Group (BBE) is currently looking for a PhD student who will work on the valorisation of brewery waste mined biopolymers (proteins and polysaccharides) as alternative ingredients to prevent sub-lethality of probiotic cells under specific environmental and in-vitro digestion stress conditions. Beer industry constitutes one of the largest food industry sectors globally. Following the mashing process, the insoluble part of the cereal grain (i.e. barley, wheat, rye etc.) known as brewers’ spent grain is considered as the major brewing waste. BSG is either used as a low added-value biomass for e.g. animal feed applications or disposed without any processing. From a dietary point of view, BSG comprises a high amount of macronutrients including soluble and insoluble dietary fibre, proteins and starch as well as a plethora of micronutrients mainly phenolic compounds, minerals and essential lipids. Over the last two decades, several bioprocessing strategies have been developed in order to valorise fibre (arabinoxylans rich) fraction of BSG due to its substantial technological and bioactive potential. Recently, BSG protein isolates and their hydrolysed fractions have gained a lot attention as alternative protein source of valuable technological (gelation, foaming, emulsifying) and bioactive (immunomodulatory activity, protection against oxidative stress etc.) characteristics. · bacterial growth and volatilomic analysis (SCFA) in simulating colonic media. It is expected that that the envisaged research activities of the PhD project to be conducted in a collaborative manner between LIST (80% - main host institution) and Wageningen University and Research (20%), whilst the academic supervision and the PhD degree will be awarded by WUR. § a good command of English language, whilst notions of French or German is considered as an asset. The PhD scholarship is fully funded by the Fonds National de la Recherche Luxembourg (FNR) via the Aides a la Formation Recherche (AFR) scheme. We offer an annual gross stipend of 42187€ (subject to salary indexation) for a total duration of 4 years. A fixed training and mobility allowance of 6000€ and an one-off travel lump sum are also foreseen. 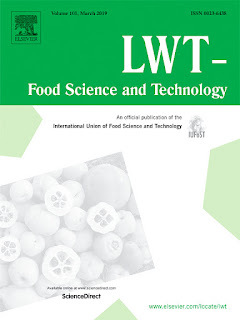 Thanks for submitting your manuscript to LWT - Food Science and Technology. However it does not meet the journal's desired standard. We regret to inform you that we cannot admit the manuscript into the formal peer review process. A revised version will not be considered. Thank you for the swift, though regretfully negative response. However, I would like to receive clarification about the reason for rejection, 'does not meet the journal's desired standard'. Since this statement gives the authors not enough information to comprehend this rejection. I contacted the editor regarding your request and I received the following response. 1. The authors did not follow the journal guidelines for submission of manuscript. They inserted tables and figures in the body of the text, which is redundant and does not adhere to the guide. 2. The details for holding the raw material, i.e. mangoes is not mentioned. How long were the mangoes held in the supply chain? 3. The justification for one thickness of chips, only two ripeness stage and one vacuum condition is not explained. If you can address the above points and revise your submission, you can submit it as a new manuscript and mention in the cover letter it is a resubmission. 14 November 2018 submitted, total submission file size was over 2 MB, so should be changed. Your work is outside the scope of Journal of Food Engineering. Overall theme still within the scope of JFE, but the paper is more oriented toward product development than engineering. The difference between ripe and unripe is small, color intensity deepens with frying time, new finding is minimal, results mostly confirmatory from thematic point of view. A product/chemistry oriented journal more suitable Therefore I must reject it. While we are unable to consider your paper for publication in JOURNAL X, it may be suitable for publication in Heliyon, an open access journal from Elsevier publishing quality research papers across all disciplines. Heliyon's team of experts provides editorial excellence, fast publication, and high visibility for your paper. Your article will be immediately and permanently available for readers to read, download, and share on both Heliyon.com and ScienceDirect. The article publishing charge (APC) for papers accepted by Heliyon is $1,250 (plus VAT and local taxes where applicable). For more information on the journal and to submit your manuscript, please visit Heliyon.com. If you are interested in having your manuscript transferred to Heliyon, please forward this email to atsadmin@elsevier.com. If you are interested in having your manuscript transferred to Heliyon, please forward this email to atsadmin@elsevier.com. This option does not constitute a guarantee that your paper will be published in Heliyon, but it is our hope that this arrangement will help expedite the process for your paper.